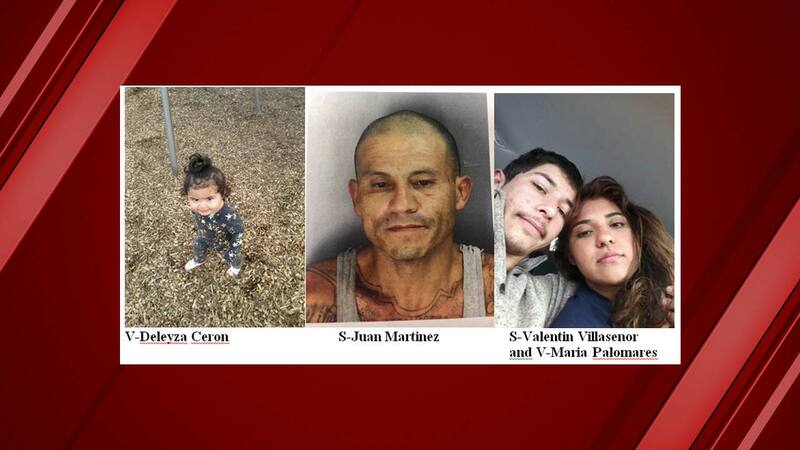 PORTERVILLE, Calif. -- Porterville Police issued an Amber Alert after a woman and her child were taken from a residence on Ohio Street between Olive and Union in Porterville. The victims were safely located after the abduction and reunited with family Friday evening. Police said Maria Palomares and her daughter, Deleyza Ceron, were taken after they came to the residence. They were confronted by Valentin Angel Villasenor and Juan Santos Martinez-- the victim said both him and Palomares were assaulted by the men. Police said both suspects then forced Maria and her child into a mid-90's stock white Chevy, or GMC, SUV and fled southbound on Ohio Street. Investigators said that Villasenor and Palomares are in a dating relationship; however, neither suspect is the father of the child. Police said they also may have Maria's brother, identified as Juan Regalado, with them. It's believed the suspects may be in the Porterville area or potentially in route to the Riverside County (Perris, CA) area. If the vehicle or suspects are located use extreme caution as they are considered armed and dangerous. Police ask for those who may spot the victims to contact the Porterville Police Department immediately at 559-782-7400.